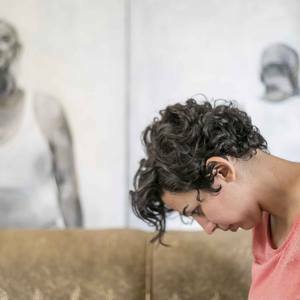 Egyptian visual artist Aya El Fallah lives and works in Cairo. She graduated from the Faculty of Fine Arts, Helwan University with honors. Her artwork is very personal .Every piece she produces coincides with a particular event and place in her life documenting her emotional and mental states at that point. Her success as an artist is in the way she captures the viewer into her world and her experiences that she simply painted on her canvas. Aya participated in various local and international exhibitions, workshops and cultural events like: “QUARTA RASSEGNA DI ARTE CONTEMPORANEA exhibition” ,Treviso in Casa dei carraresi, Italy ,”The first Egyptian group exhibition” on the sidelines of the Venice Biennial, Cairo Salon, , “7 Egyptian Artists” at Al-Hanager Arts Centre, located within the Cairo Opera House grounds, kicking off the second Independent Arts Festival ,”Master piece Exhibition “and “The Freedom exhibition” , Zamalek Art Gallery. “The Supermarket exhibition” ,Gezira Arts Center, “Human body” exhibition ,Palace of art,Opera house, “Faces exhibition”, Ofok Gallery ,Mahmoud Khalil Museum, “Between the brackets exhibition” , CIC and She also participated in The Youth Salons of 2007, 2008 and 2011. At a very young age Aya managed to create a mark for herself as an artist making her standout among many of her peers.